Pump switches are designed to control the operation of a submersible pump. They can handle higher amperages than control switches. These are generally are wide angle which means they have to move 90 degrees to switch to the “ON” or “OFF” position. This is needed when controlling a pump because you have to be able to pump out a range of water and it also keeps the float from being interrupted by turbulence in the water. When choosing a float switch to control the operation of a pump, the first question that needs to be answered is about amperage. Since the power for the submersible pump will be flowing through the float switch it will need to be able to at minimum handle that amperage. Our most popular floats come in the following levels: 13 amps, 15 amps, and 25 amps. Once you determine which amperage float you need for you application a decision will need to be made about how this float will be installed. Our float switches come either with a piggy-back plug or without a plug. 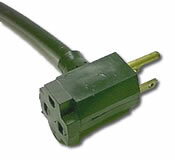 If you purchase a float switch with a piggy-back plug the installation is very simple. The plug on the float switch will plug-in to a power outlet, and then the pump will plug into the piggy-back outlet on the back of the float. That is all there to it, your pump will only come on when the float is in position to allow it. Pump switches without a piggy-back plug must be hard wired, and this gets a little more complicated. Floats are all two wire so to install on a pump you must splice the float switch in the “HOT” line coming from the power source. This splice should be done in a control panel or waterproof junction box to ensure that the connection does not get wet and cause a short. The last option that you have available is whether to use mercury or mechanical. Mercury switches use a small amount of mercury liquid to open and close the contacts. Mechanical switches have a ball bearing on a track that moves back and forth. While mercury switches are said to be more reliable, they are not allowed by law to be used in some states (see our website) and are only available in 13 amps.